Another Beautiful Day in Paradise. The weather cooperated with the temperature about 65, party cloudy skies, a slight Northern breeze and no rain drops. Bladers/Bicyclers Roy H, John B, Dorey Anne, Theressa & Chris V, Rob H, Janice H, Rick & Ginnie, Carol J, Rob H, Darlene B, Nick S, Dimitri F, Rick the Breeze, Bruce M, Steve G, Wendy H, Cindy S and Jeff B. Welcome all. We discussed doing the neighborhoods or the Trail. The neighborhoods won. Roy H guided us skillfully through the neighborhoods for an 8.6 mile route. Thanks Roy. We had 3 bladers and 15 bicyclers. Breeze and went home to help Laura and Darlene walked her dog and waited for Jeff. Breeze Jr. took the group picture. We Brunched as planned at Breeze's home. Chuck & Debbie, Deb B, Deb D, Amie, Kyle, Joel and Kim F, Breeze Jr and others joined us for the Brunch. Breeze Jr. cooked steaks for anyone desiring one. Breeze have a beautiful and spacious home which all enjoyed. They had more delicious food than we could possibly devour even though we did try. 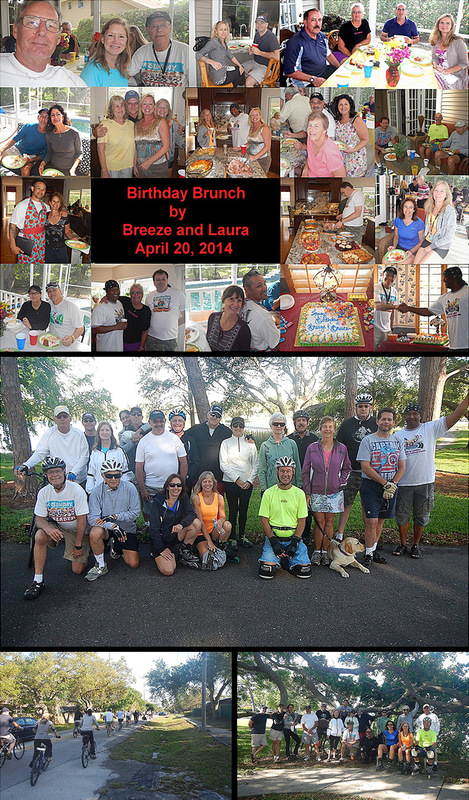 Thanks Breeze and helpers for a grand and wonderful Brunch.